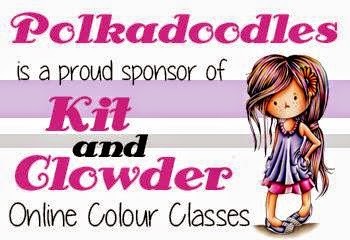 Hello Polka Doodles fans, it's Friday again and yet again it's where did the week go as it's time for a new challenge already. Hope you're raring to go but before we get on to the details we're thrilled to have the lovely Rosemary Merry appearing on Create and Craft TV on Tuesday 3rd July at 8am and 2pm so do watch if you can but if you can't then don't forget to set the recorder as believe me, you won't want to miss it! Before we get onto this week's challenge let's find out the winners from challenge 24 which was Create A Summer Scene. So, onto this week's challenge! The winner this week will win a gorgeous Emma Canning Download - if you haven't yet seen Emma's totally fabulous digital images you can get a sneak peek HERE. You have until noon (GMT) on Sunday 8 July to enter so make sure you get your entries in to be in with a chance of winning this fab prize! Now I'm sure you all want the challenge details. Your hostess with the mostest this week is Emma and her chosen theme is Fairies, Fantasy and Flitter which she says means that she would like to see a fantasy theme or a fairy flittered with a magical dusting of glitter - how about that for a fab theme! 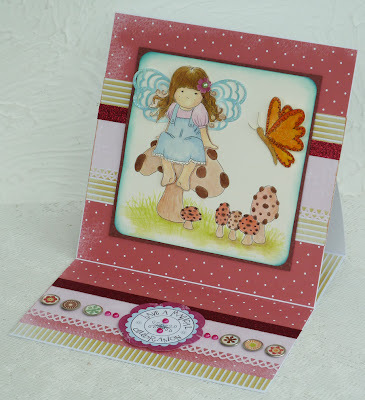 Norine: I loved getting all fussy and fancy with this week's fairy challenge!! Paper and image are both from the yummy Sugar Plum Daisy cd. I painted Stickles on the wings and then added some Martha Stewart glitter as well. To complete the card I added a paper doily and made up a little bouquet of miscellaneous paper flowers and ribbon I had in my stash! 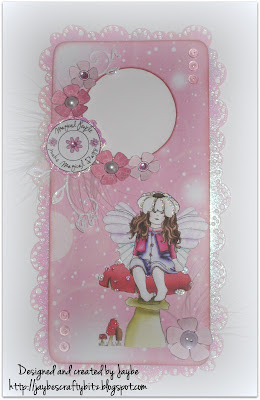 Fliss: I've made an easel card for the challenge this time and have turned one of the cute little girls from the Pretty Sweet CD into a fairy. I printed out both her and some of the lovely toadstools from the Sugarplum Daisy CD on cartridge paper and coloured with my fave Aquamarkers. I added a little texture with pencils. I made the fairy wings using a Marianne Design butterfly die which I coloured and glittered. 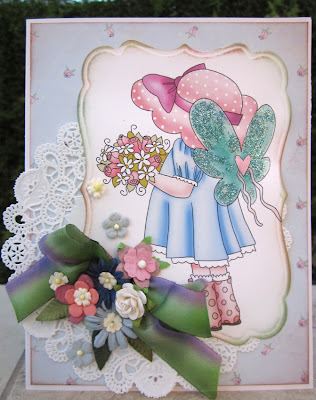 The card was assembled with lots of layers as you see and embellished with a glittered butterfly from the Sugarplum CD. Nelly Hello everyone, well I'm back crafting after a short spell away and I certainly missed my postings and crafting, loved making this circle side stepper easel card using elements from the Sugar Plum Daisy CD I absolutely love the moon on this CD, image is coloured with Pro Markers and the sentiments are also taken from the CD. JAN: I think most little girls like fairies, so I decided to make a door hanger for a girl's room this week. I used paper and images (toadstool, fairy, butterfly wings and sentiment) which are all from the fantastic 'Sugar Plum Daisy' CD. I chose the ready coloured images this time and simply printed them off and decoupaged them onto my project. The pink flowers are printed from the 'Sugar Birdies' CD and have been embellished with bits and bobs from my own stash. A few Polkadoodle dew drops accent the corners and it wouldn't be fairyland without a sprinkling of stardust glitter! Shell-I loved making this card, I have used an image,sentiment and papers off the Sugarplum Daisy CD. She's been coloured with copics and I have covered her wings in glitter, the flowers are from my stash and have been dipped into glitter, then to finish it off I added little drops of glitter as if she is watering the flowers with glitter. NJ I love fairies, they are one of my favourite things along with butterflies! For my Fairies & Fantasy card I have used an 8x8 card blank and made an aperture. I have used the All Around & Everywhere CD and also the Sundae of Seasons CD. I used Diamond Stickles for sparkle and added Dew Drops. Claire: I love fairies, so couldn't wait to create something. 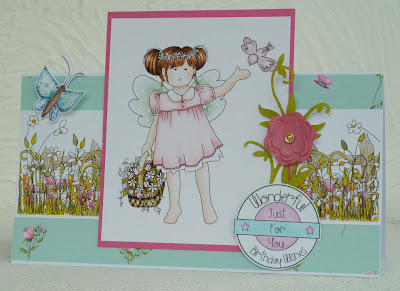 I've used the fairy and foliage images from the All Around & Everywhere CD and the watering can, window & door (which is the window with the shutters chopped off) from the new Studio 12 Picknix Heavenly Garden Kit to create my stepper card. 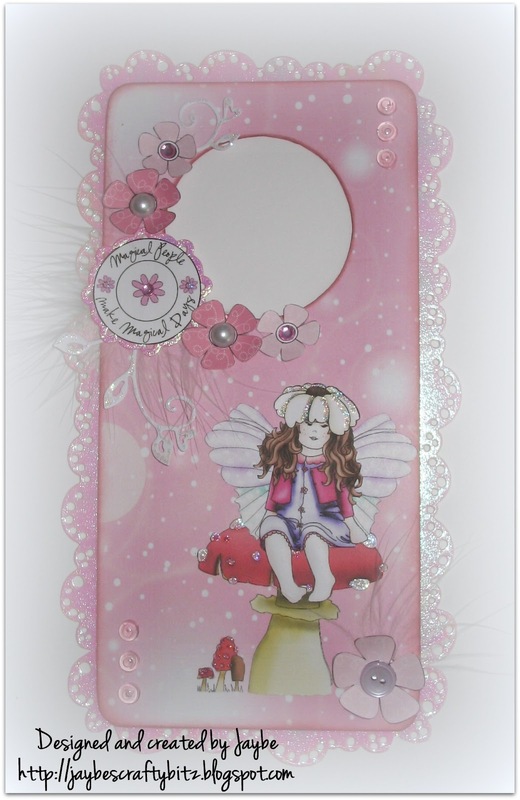 Lou: Now I stretched the fairy theme a little with my card this week as I have used one of the gorgeous Christmas fairy (okay .... angel) stamps for my card. I so wanted to use this stamp and she does look fairy like, doesn't she? A simple embossed background which I have inked with distress inks, some ribbon offcut, glittered leaves, paper off cuts from Pretty Sweet CD and Doodle Dew Drops. The images was stamped with Walnut distress ink and then water coloured with Walnut and Rose Pink distress inks. We can't wait to see all your entries and please don't forget to check out the rules. Hey everyone, boy do we have lots of news for you this week! First of all, make sure you watch Nikky tonight (Friday) and tomorrow (Saturday) on Create and Craft / Ideal World TV (9pm and 11pm tonight; 10am, 3pm and 7pm Saturday) with some great Letraset shows for you! So we have been completely swamped at Doodle Towers over the past couple of weeks since the Picknix Collection launched - man o man you know a good one when you see it, we sold out of our stock in less than 10 minutes, added more again and then sold out again 12 minutes later and we're still struggling to keep up with production now! If you didn't see it you can check it out here and make sure you nab it before it goes back to normal price too! Talking of Design Teams, I hope you've all seen our TWO Design Team calls which close on Sunday! If you haven't entered yet make sure you check them both out, we're looking for very different things on each team, the Polkadoodles call is here and the Studio 12 call is here - go, go, go!! 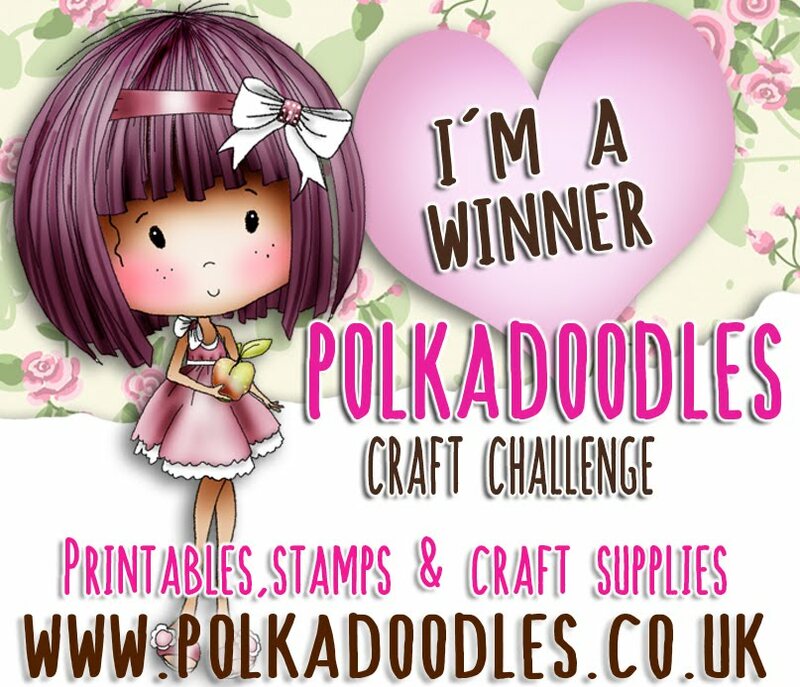 Well done everyone, you've all won a Polkadoodles CD! In addition to these 4 lucky winners we also had an overall challenge winner who wins 10, yes, 10 CD's worth a massive £160!! wooohooo!! And the very lucky winner is ... No. 18, Jayne! Well done Jayne, what a stash to win! Can all of the prizewinners please email us with your snail mail addy's so we can send your prizes please! Please add "Birthday Bonanza" into your email title. These cuties are awesome once they've been coloured in and again the DT are absolutely LOVING these girls, so go grab them now - we'll also be adding more options to the range in the coming weeks, we just adore Emma's girls! Congratulations! Please email Nikky for your prize and grab your blinkies from the sidebar - the first placed winner receives a download! Please remember to put your verification code and the challenge week in the subject field on your email. In addition, you must use the same email address to claim your prize as your challenge entry otherwise we cannot release your prize. So, onto this week's challenge! The winning entry this week will receive a FREE Picknix CD to add to their stash! Hi, Polkadoodles lovers! Miria from Italy here. This week's challenge theme is up to me. I got inspired by a typical British ceremony and I chose Trooping the colour(s): you have to use not just one like the Queen but as many colours as you can, a real challenge for me, too as I usually like using matching colours or even monochrome! You have until 12noon (GMT) on Sunday 1 July to enter so make sure you get your entries in to be in with a chance of winning a fab prize! Ruth: Well, this is a lot of colour for me! 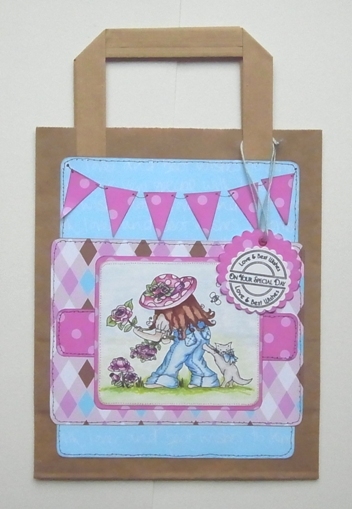 I've altered a plain brown takeout bag and used the Pen and Paper Circle Club kit 1, which is now unavailable (sorry!) but sign up to pre order kit 4 as soon as the notification is given! I've coloured the image with Promarkers and used some scalloped Netabilities for the sentiment and tag. Fliss - Well, I think you might agree I have a riot of colour on my card as I decided the best way to incorporate lots of colour was to do a garden scene. All papers and elements are from the Sugarplum Daisy CD as the bright summery colours are really needed in the weather we've had lately. The only embellishing due to the busy style of the card is a touch of punching and stitched ribbon. Shary Quite a hard challenge for me too this week but I think I managed to add a lot of colour! I made an easel card and I've used images, sentiment and papers from the Pretty Tuff CD. I then added some of my own buttons and ribbon. Miria For my card I used a coloured stampie from cd Candy Doodles then I created the multicoloured background using scraps from various PD cds. The sentiment is from a stamp set of PPC issue 2 and I added just some buttons. Anne - I didn't find this as easy as I though I would. 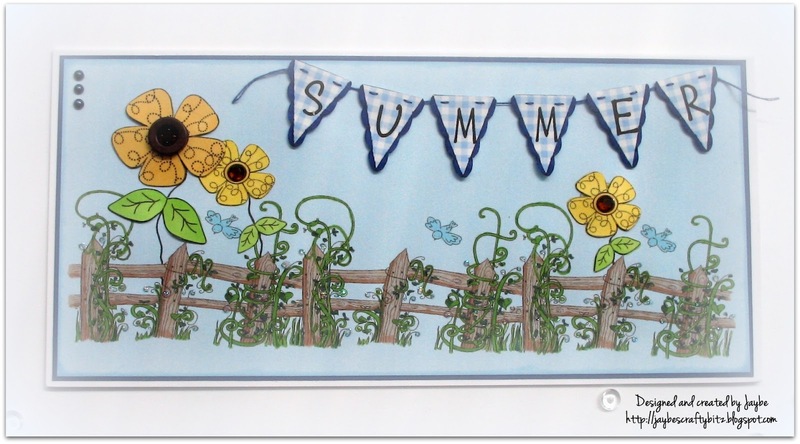 So I then decided that these pretty little banners from the new Picknix Collection (In The Garden) were the way to go. the card materialised from there. So many yummy things on there that I didn't need anything else. Lisa - I haven't made a kinetic card for ages so thought that the images from the Sugar Plum Daisy CD would be perfect to use for this Quad Easel card. Good luck with the challenge! The link will be open until 12noon GMT on Sunday 1 July and don't forget our rules! Hello everyone and a warm welcome! 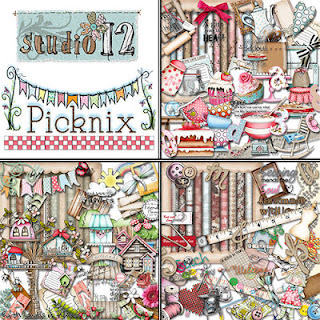 What a busy time we are having here... what with the fantastic new launch of the Studio 12 Picknix Collection which is utterly gorgeous and a definite must have, and also a Design Team Call for Polkadoodles and also a Design Team Call for the fabulous new Studio 12 at Polkadoodles . Click on the links to read the requirements for the calls! Exciting times ahead! Congratulations! please email Nikky for your prize and grab your blinkies from the blog sidebar! Please put in the subject field of your email your placing and the challenge number and don't forget to add your verification code to claim your prize. Emma - Hello there, this week I have chosen elements and a beautiful little scene from the Sugar Plum Daisy CDROM to make my card. Pre-coloured for speed - how delightful! 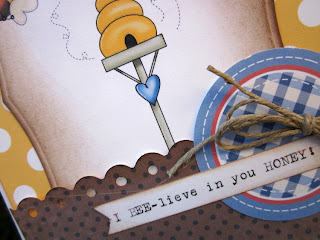 And, because I love this image sooooo very much, I made two cards this week. Nelly - i made this little wall plaque using elements from the Double Sprinkles of Kraft CD i took the images and decoupaged the Bird houses and glazed them with clear glaze, the sentiment is from Sugar Plum Daisy CD ...now i do wish the sun would come out to start our summer fun! JAN: I imagined a lovely meadow when I thought of a summer scene, so I used this gorgeous little piece of fencing from the 'Sugarplum Daisy' CD and repeated it three times to make the scene for my card - it is all hand coloured using Promarkers. I added some fab flowers from the 'Sugar Birdies' CD and decoupaged them behind the fence, as if they are growing in the meadow. The 'Summer' bunting is from the 'All Around & Everywhere' CD and is printed onto some scraps of blue gingham paper. NJ For my summer scene I have used the fantastic new Studio 12 Picknix Collection. 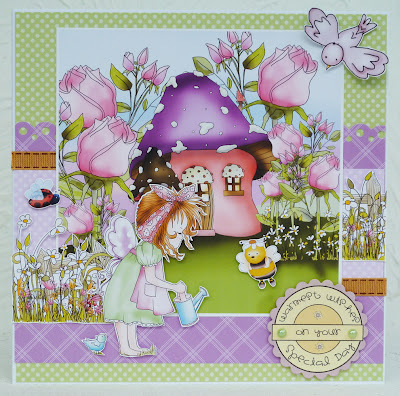 The kit I have used for my card this week is In The Garden Collection. I absolutely love the Studio 12 Digikits, so many possibilities to use them for. The summer scene I wanted to depict was like a Summer Fete with a lemonade stall! 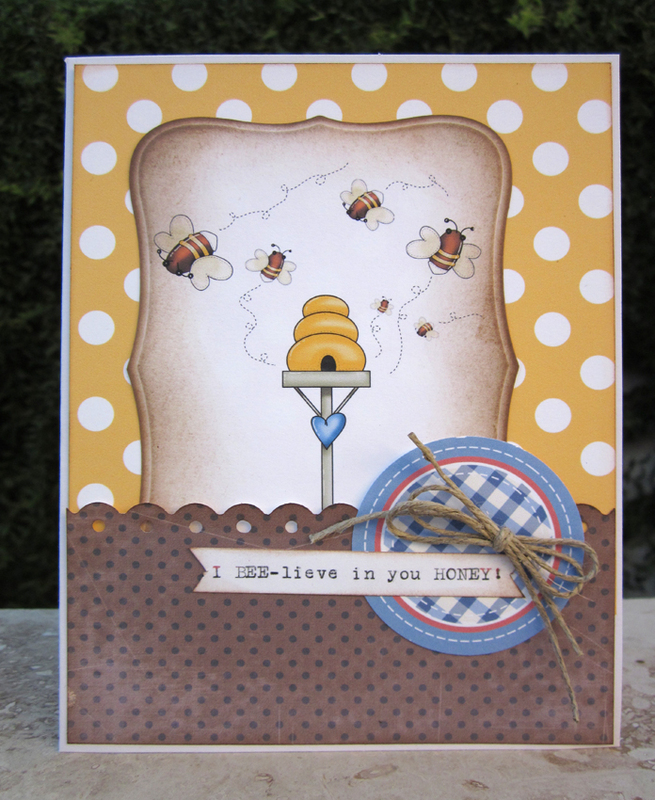 Shary I've used the brand new Studio 12 Picknix Collection for my card this week. I've used a two of the three collections. 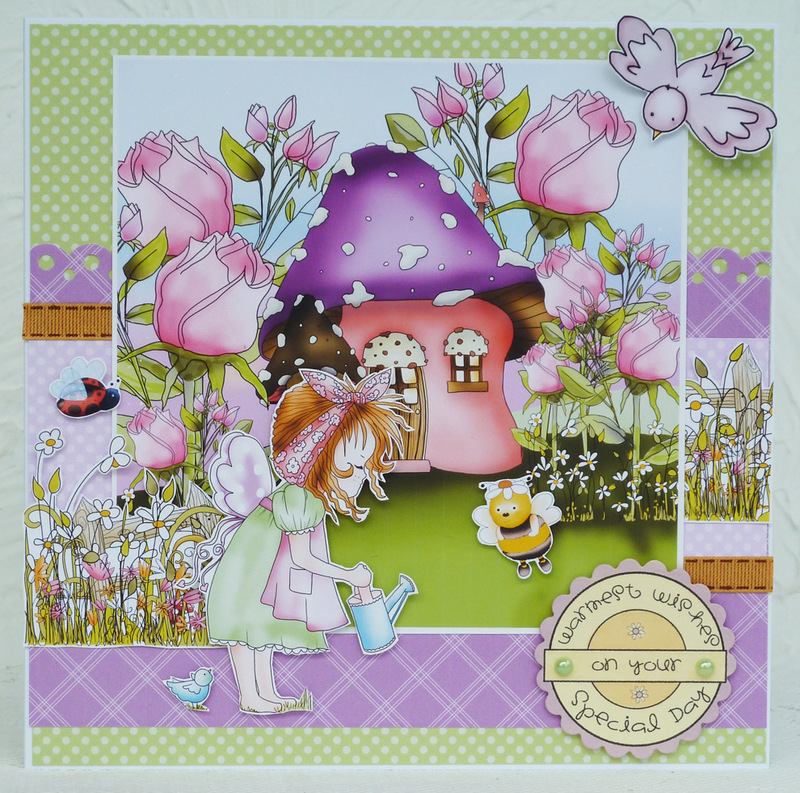 The papers are from Welcome Home , the elements and sentiment are from the Heavenly Garden collection.The Heavenly Garden have both digi stamps and full colour embellishments on them. I took the bird house as a digi stamp and coloured it in with Copics. 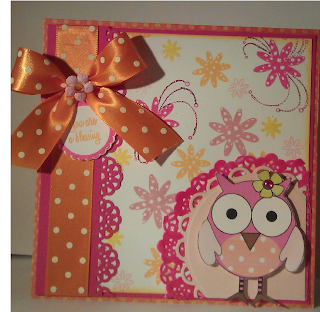 I've added stickles,clear star pen, twine and gems too to my card. Shell-for my inspiration card this week I used the gorjuss image, papers and sentiment of the Sugar Plum Daisy cd. The image has been coloured using copic, I added a few pearls from my stash. I made the clouds with distress inks using a blender tool and a stencil made from card. Claire - How lovely is the new range from Nikky called Studio 12 Picnix collection. I had loads of fun working on my samples for the new release and this I felt was perfect for the summer challenge! Norine - I loved using this cute, cute image from the Sundae of Seasons cd! Matching it up with patterned papers and a sentiment circle from the same cd. I typed the "I BEE-lieve in you HONEY" on my vintage typewriter and I love the results! Claire - Oh I struggled with this challenge, just not feeling the love for summer! I decided that I'd try and lift my mood by scrapping a summer holiday piccie of my son. I used the new Studio 12 Picknix Heavenly Garden collection for the sand coloured background paper, the sun, cloud and bunting. The lettering is also taken from the Studio 12 collection - All Sewn Up. The blue paper was taken from the Candy Dooodles Collectors Edition CD and the cute little beach huts came from the Sundae of Seasons CD. 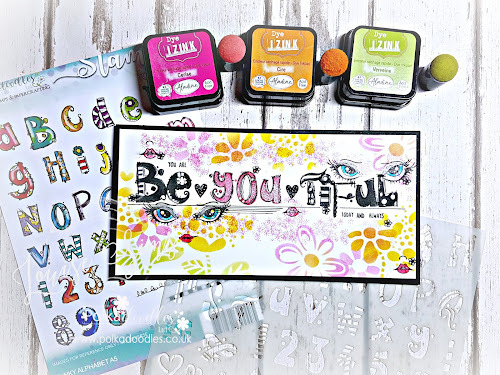 Anne - I've used the brand new Studio 12 Picknix Collection this week. For my creation I used the In The Garden Collection which is perfect for the theme this week. So there's your inspiration - some fantastic projects from the DT this week I think you'll agree! You have until Sun 24th June at 12 noon GMT to enter the challenge, so just add your URL to the Linky below! Good Luck! We are currently looking for a couple of additional team members to join us! If you love making "stuff" from paper and 'heart' combining paper, digital elements, rubber stamps, doodling, stitching and mixed media we would love to hear from you! We're looking for the best of the best creative minds to join us so if you think this will float your boat then please apply. Polkadoodles is a challenge blog and you MUST be committed to post at least 3 times per month on this blog and link to your own blog regularly (you MUST have a blog which is updated regularly), plus be active on forums, blogs and social networks. If you are a UK resident you MUST be able to produce physical samples which include cards, altered items, scrap layouts etc and to produce these to deadlines when required (non UK residents have some allowances for this). You will be working mainly with digital elements but other products will also be used and HYBRID crafting is the theme of our blog - if you ONLY create flat digital layouts please do not apply, we want to see layering and embellishing and creativeness between physical crafting and the digi world. This is not a paid position but you will receive products free of charge in lieu of promotion through the blog and the duties outlined above plus will get to showcase your work on the UK's dedicated crafting channel Create & Craft. We are happy for you to be on other design teams but not at the expense of Polkadoodles and we cannot emphasise enough that we expect commitment if you are chosen for the team, so please ensure you are able to accommodate with any other design teams. We need you to be passionate about what you do and committed for a minimum of a 4 month term on the team. Cardmakers, Scrapbookers and Altered Media artists are welcome, we are looking for a diverse team. We will specifically welcome applicants from USA/Canada, Australia, Europe and all around the world as we would like to build our international team too - so please don't be shy!! 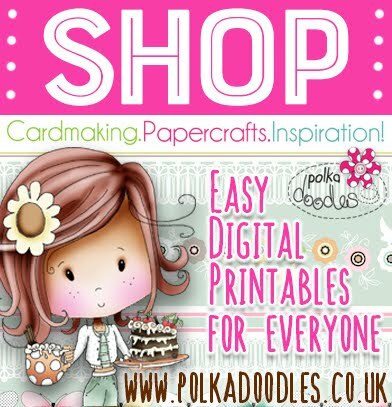 To apply: Please email sales@polkadoodles.co.uk BEFORE 19 June 2012! PLEASE state POLKADOODLES DT CALL in your email TITLE and including your blog link, a short paragraph about why you want to be on the team and attach images of your favourite 3 pieces of work you have personally created on the email. We will notify you by email before the end of June and will reply to everyone who applies by 30 June. Hello everyone, it's Fliss here today with details of this week's challenge which I hope you're going to love as I picked the theme! Before we get to that though, I need to tell you about tomorrow's exciting happenings. Saturday sees the launch of a brand new collection by our Nikky and she will be on Create & Craft TV tomorrow at 12 noon and 4pm with the lovely new addition to the team, Rosemary Merry, to tell you all about it. Definitely not to be missed! The Design Team have been so excited to work with the gorgeous new collection and I know we all want to show you what we've created! No sharing until tomorrow though! In the meantime, we never stop here and the team have had a fantastic time creating some amazing projects to inspire and delight you however, before we get onto this week's inspiration, let's find out the winners from challenge 21. 1. Please follow the challenge! 2. 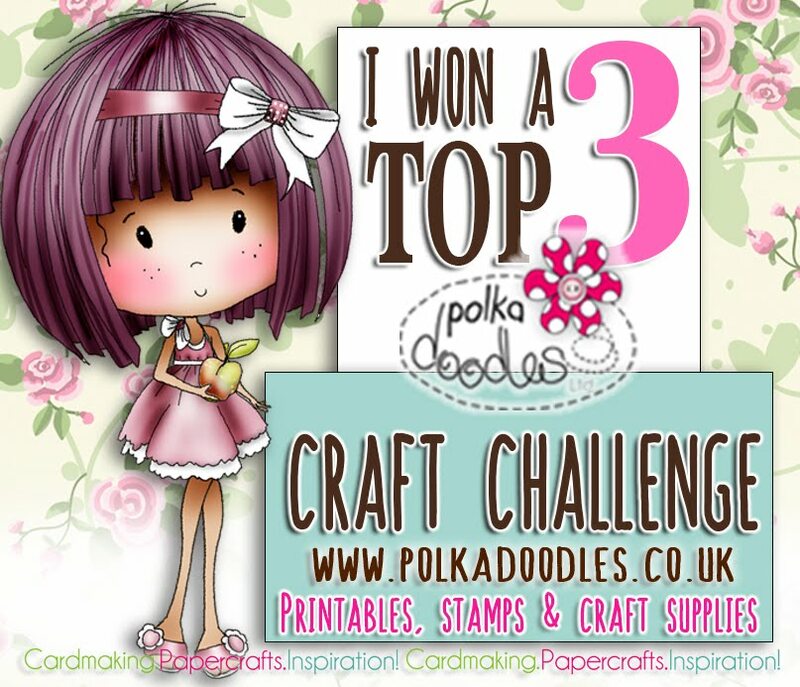 Only enter your creation into a maximum of 10 challenges including Polka Doodles. 3. Please link your blog post and not your blog address with the blue frog - this saves us from searching your blog for your entry. 4. And please no back-linking to previous posts - these will be disregarded from our top three voting. 5. If you have comment moderation and word verification on your blog it really does slow us down when leaving comments - please consider turning word verification off especially now that comment moderation has a spam section. Now for the all important details of this week's theme which is Lots Of Flowers, as many as you can add in the form of background papers, a floral image, paper or fabric flowers etc etc. Here's what the Design team have come up with and I think you'll agree there are a lot of flowers here! 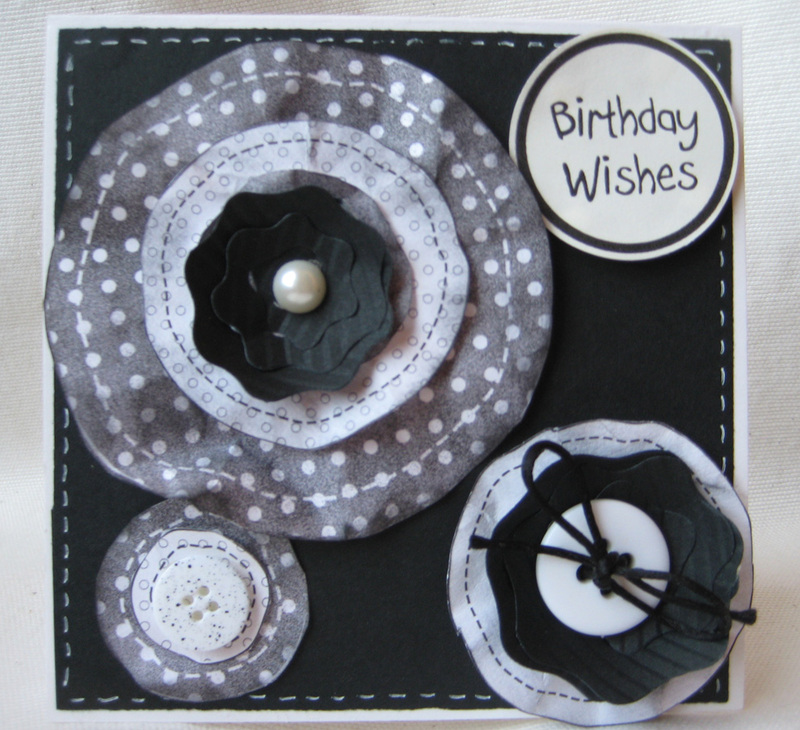 Ruth: I've gone for an old favourite and used Paper Boutique Vol 1 for this wonderfully shaped card! I used the A5 pre printed version and cut everything out, layering up the flowers with foam pads. For an extra bit of bling, I've added seed beads to the flower centres and glitter around the edges of the flowers. Daniele, for my card I thought I use the Daisy doodles stamps this time, colouring and embossing some of them and then layering them up. Miria For my card I used these superinspirational flowers and sentiment from cd Candy Doodles , I simply distressed them with Black Soot Distress Inkpad. I added two die-cut flowers from Marianne Design and buttons. Lisa - The Crafting Owl. I used my fav CDROM Sundae of Seasons for the fab papers and seeing as the theme is flowers, Marianne Dies were the obvious choice. Ashley- I made my own background flower paper using the Daisy doodles rubber stamp set (flowers), I also used the adorable owl from the Sugar Birdies CDROM. Fliss - I've made a simple shaped card using a pretty image and gorgeous rose paper with a floral border from the Sugarplum Daisy CD. As you can see there are loads of flowers here. I made a floral embellishment using a layered flower die and leafy flourish by Marianne Design and finished off with a sentiment and pretty butterfly. Patty - I've used a sweet image from the Sugarplum Daisy CD using plain papers and embossing for texture. I added a pretty lacy die cut circle and some stamped flowers to finish off. Some fabulous inspiration here and we can't wait to see your creations. You have until 12 noon on Sunday 17 June to enter and please don't forget to check those rules. Hello there and welcome to this weeks fab new challenge where we get to celebrate the Queens Jubilee by incorporating regal colours in our designs. Before we go any further, we also have some really exciting news to share this week. We are delighted to announce that the lovely Rosemary Merry has joined the Polkadoodles team and will be demonstrating for us regularly with lots of new and exciting things coming up. Rosemary is a reknowned through the UK craft industry and was QVC's resident Scrapbooking expert for many years so she brings something fresh to the PD camp and we can't wait to see her take on what we do here! We just know you're going to love her and together, Rosemary and Nikky are a great creative partnership we think! The design team have all been playing with the new collection this week and you are just going to love it - so versatile! So don't miss Nikky and Rosemary bringing you lots of inspiration next Saturday! In the meantime, we never stop here and the team have had a fantastic time creating some amazing projects to inspire and delight you however, before we get onto this week's inspiration, let's find out the winners from challenge 20. Nelly; For this weeks theme "Jubilee card" I took "Piper" from Pretty sweet CD and paper pieced her dress and then coloured with pro markers, thought I would dress her up for the occasion and took the Crown from all around the world and everywhere Cd and resized it to fit nicely on her head. i used Marianne Creatables LR0180 & LR0150 Circle and leaf dies. 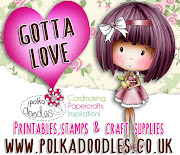 the sentiment is a Polka Doodle stamp the design paper was design by Nikky for Polka Doodle Dandies Group Challenge on our Facebook page (search for Nikky Hall) you simply must pop over to grab these and join in!! flowers, gems and ribbons from stash. NJ For my Diamond Jubilee card I chose to use papers from the Love & Cherish CD I also printed the crown from this cd and coloured in using Promarkers in Ruby Red and Yellow. I also used a gold pen to give a metallic look to the crown. I typed my own text and matted onto paper from the cd. All edges are inked with Distress Ink Vintage Photo. I wanted to give the card a Regal look with lots of jewels and a Filigree button and an ornate key. I have used spellbinders labels to matt the crown onto. 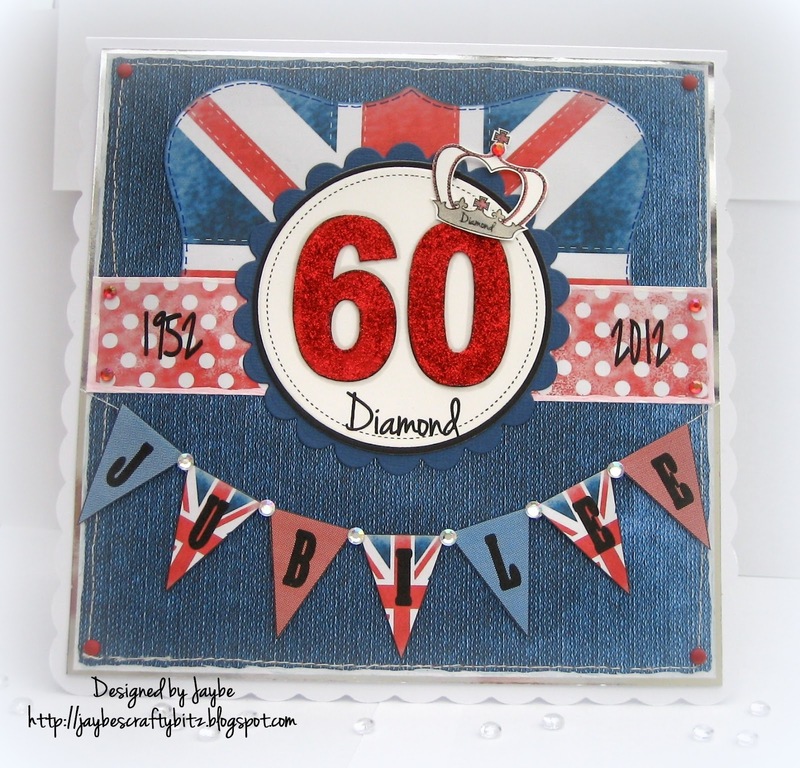 Jan: I have stayed with a traditional red, white and blue colour scheme for my card to celebrate the Diamond Jubilee. The yummy papers are from a collection designed by Nikky Hall, as is the little crown which sits on top of the '0'. The bunting is made from matching papers using a template from the 'All Around & Everywhere' CD and is embellished with lots of bling. The '60' topper is also from the 'All Around & Everywhere' CD and has been edited to include the word 'Diamond', before being seriously glittered in red! Shary For my card this week I've used an assortment of different papers from various Polkadoodle CDS. The papers are from Pretty Tuff , Not for Girls and I've also used the flag paper from the freebie "Britannia" that Nikky offered on the Facebook group. The papers have been edged with a blue ink. I also made some bunting from the papers. The image is from Candy Doodles and I've used Copic to colour him. Just some little buttons to embellish the card too. Shell-For my card this week I have used the Britannia digi papers Nikky gave to the Polkadoodles Facebook page. The cup and saucer are from the Sugarplum Daisy cd. The sentiment I made using an app on my iPhone. Claire Decided to go for some Red, White and blue with a large helping of gold this week! My main blue checker paper this week came from the Not for girls cd, I adapted the christmas bunting paper from Magical Winter cd to create 'Glorious years' and the 60 numerals are also Polka Doodles . I thought they all worked really well with the printed cogs and wheels which believe it or not are the back of some old round playing cards! Dee: My card is made with papers and images from the Sugarplum Daisy CD again, a few die cut scallop circles and pearl PVA and bobs your uncle, you have a card. Claire: I decided to make a Jubilee Bird House this week using the bird house template from the Candy Doodles Collectors Edition CD and the freebie papers and images from the Polka Doodle Dandies Facebook Page. The little mouse is of course from the Sugarplum Daisy CD, I've simply given her a new outfit for this occasion. So there's your inspiration - some fantastic projects from the DT this week I think you'll agree! You have until Sun 10th June at 12 noon GMT to enter the challenge, so just add your URL to the Linky below! Good Luck!